« Sequins of Doom — Conquered! Another May has come and gone, and again I jumped right in to Me Made May. It’s just so much fun to see what people are sewing and share my work. It seems like it was a bigger thing on Instagram than Flickr this year. Following is my image gallery for the month. In previous years, I’ve linked relevant blog posts about the garments, but I just can’t be bothered to put links in at this moment. If you have any questions about any of the garments, please leave a comment and I will be happy to point you to the blog post (if there is one) or answer your questions. Here’s what I learned from Me Made May this year: red lipstick makes every photo better. 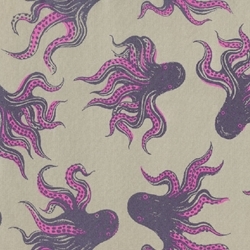 I know that Me Made May has a bit of an anti-consumerist vibe (which I’m totally on board with), but several people in the Instagram group posted garments in this amazing octopus print from Cotton and Steel. I just had to get some from Michael Levine. I’m planning on making a buttondown shirt with it. This entry was written by Claudine, posted on May 31, 2015 at 3:55 pm, filed under Fashion blogging. Bookmark the permalink. Follow any comments here with the RSS feed for this post. Post a comment or leave a trackback: Trackback URL. I love the long denim skirts. Is there a blog link or a pattern name? Thanks. I love the wide-leg trousers, worn with a plaid shirt. Did you blog about these? I’m just about to make my first pair.